The Jesse Bradley House, c.1840, was transformed for the next generation with many modern updates while maintaining its historic integrity with rosewood and wide plank pine flooring, six-foot high windows with original and restoration glass, and period molding. WESTPORT — A valuable lesson about the value of history was instilled in Tricia Wentworth from a young age. “I grew up in a vintage house. I am very passionate about history and about preserving history,” said Wentworth, who served as treasurer for the Westport Historical Society, only leaving the post recently because of an impending move. 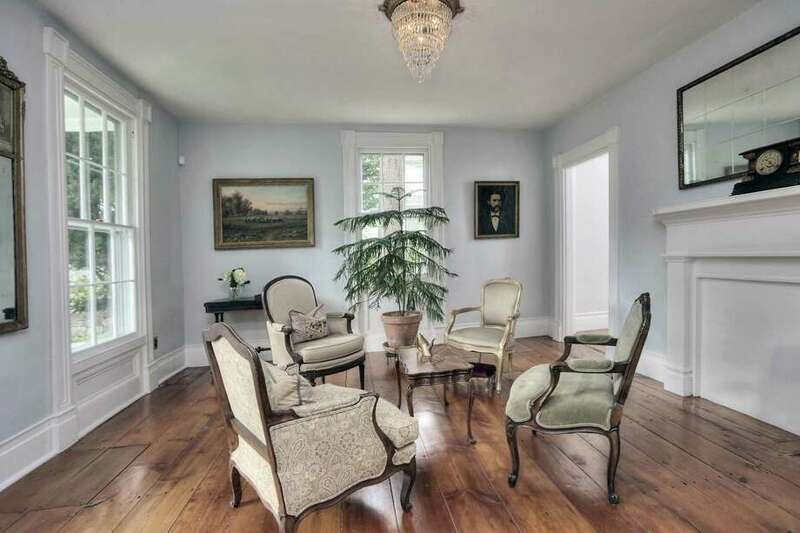 Wentworth and her husband, Mark Fagan, are the owners of the yellow antique Italianate Victorian house at 54 Wright Street, one of Westport’s early treasures. It has been included on the Westport Historical Society’s Holiday House Tour twice. The house is in the Old Hill neighborhood within walking distance of downtown Westport, Kings Highway Elementary School, and other local amenities. The Jesse Bradley House was originally built circa 1840 as a Greek revival. In the 1870s its then-owner gave it the Italianate styling on the exterior facade and flat roofline, although it was not continued into the interior. Wentworth is responsible for imbuing the house with a more Victorian vibe, doing the designing herself rather than hiring a decorator. Fagan did a lot of the painting himself. The house and its restored barn — built in 1842 — are located on three-quarters of an acre in the Kings Highway North Historic District. It is comfortably poised between past and present, and the current owners have ensured its continuation as an attractive, welcoming and functional residence into the future. They have transformed the 11-room house for the next generation. Back in 2000, the family remodeled the back of the house expanding it to 4,073 square feet of living space. They turned a screened porch into a mudroom and added a laundry room, a large butler’s pantry with Vermont Verde marble counters, and a bedroom. They also created an exposed brick bath by the central chimney. The barn restoration, inside and out, took place the year before that and later they lengthened the driveway to access the barn, which is now used as a two-car tandem garage with doors on the front and back. Wentworth said the barn was in disrepair when they purchased the property. The restoration included lifting the barn to install cement pylons, gutters were installed and the barn was re-roofed. During the house renovation historic elements of the house were preserved, including rosewood and wide-planked pumpkin pine flooring, six-foot high windows — some with original re-glazed glass and others with restoration glass, fireplaces, period molding, paneled doors, and hardware — all the while taking inspiration from the Governor’s Mansion in Colonial Williamsburg. “We had the new doors milled so they looked just like the old ones,” Wentworth said. They opened up walls to create a more logical and functional circular floor plan, and accidentally uncovered a back staircase behind a plastered wall. They gave the home a chef’s kitchen and converted the third floor attic space into a family play and work space with a reading area and study place and fun porthole windows on all four sides. It has become a hang-out for kids and their friends and a great place for movie-watching. A circular staircase leads to the sizable cupola, large enough to serve as a sitting or reading room, with arched windows. “It was fun, and a project. It was a labor of love,” Wentworth said. As a kid she scraped wallpaper and refinished furniture so this restoration work “was in my DNA,” she said. “If you own an old home you are a steward of history. You have to take that job seriously and try to preserve that home,” she said. Inside, the library was the original kitchen when the house was first constructed. Today, the library is a relaxing space. “Mark and I sit every evening in the library to sip wine and deconstruct our days,” Wentworth said. She also loves the formal dining room, which has one of the home’s two fireplaces, and “dresses up beautifully no matter the occasion.” The front parlor tends to be the best room for solace and reading. The kitchen features the same marble counters of the pantry, double stainless sinks, and new Bosch, Sub-Zero and Wolf appliances. On the second floor there are four bedrooms. The front-to-back master has exposed beams, a sitting room and an en-suite bath with dressing room. Three additional bedrooms share a pair of fully renovated full baths. FEATURES: historic home in a historic district, historic barn/detached two-car garage, 0.75-acre level property, deck, patio, mature gardens and fruit trees, programmable thermostat, storm doors and windows, Thermopane windows; walking distance to downtown shops and restaurants, the Nature Center, Kings Highway Elementary School, and public library; just minutes via minibus to the Saugatuck Metro North train station, a short drive to the beach, cable available/pre-wired, two fireplaces, stone walls, natural gas heat, 50-gallon water heater tank, partial unfinished walk-out basement, finished walk-up attic, room for an in-ground swimming pool, four bedrooms, three full and one half baths. In the backyard there are majestic stone walls, mature gardens and fruit trees. Wentworth did all the gardening. “I loved the challenge of transforming and creating gardens all around the property. Every year I picked a corner. One year I found May apples in a mass of weeds. Now I have a beautiful section of May apples. They’re just gorgeous,” she said. “I hope that the next owner will enjoy our yard and our gardens as much as I have,” Wentworth said. There will be a public Open House on Jan. 27, from 1 to 4 p.m.
For more information or to make an appointment to see the house contact Michael Mombello of KMS Partners/Coldwell Banker Residential Brokerage at 203-227-8424 or michaelmombello@gmail.com.